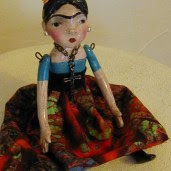 nancye's art and beautiful junk: Yeah Suzi! Don't Look Back... After a glance, she knew she must follow her heart. I love doing the class with Suzi Blu. I'm just starting to do some collage/painting type that I am freeing my spirit to do. It is freeing for sure. There is still time to take the class. Just click on Suzi Blu under my favorite blogs to the right and enroll. I am working on some Halloween stuff to sell later this week. She is so adorable!!!! Did you do this in your journal? I love it! !